Om Shri BhuvaneswariMoorthaye Namah! Thank you for visiting the official website of Puzhakkarakavu Bhagavathy! Beauty and holiness flows to a point where three rivers (Kaliyar,Kothayar and Thodupuzhayar) confluence naming the land Muvattupuzha(means joining of three rivers). 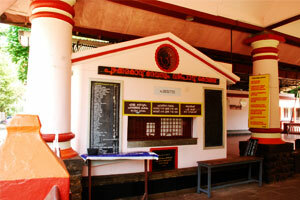 Shining at this Thriveni's holy bank situates the shrine of Puzhakkara kavu Devi blessing the worshippers benevolently. As per legends this temple is 2000 years old and the Devi here is 'Swayambhoo'(self originated). Half kilometer away from the busy noises of Muvattupuzha town, enchanting all people irrespective of caste and creed establishing the Devi expressing in three styles. At dawn Devi is Sree Bhuvaneswary, afternoon she is Sree Vana Durga, and evening Sree Bhadra. In olden days the wild tribe worshipped this temple and gradually developed to the present situation. For years Thengode Mana was controlling the day to day affairs of the temple and in 1976 administration was vested to a local trust selected from the devotees. 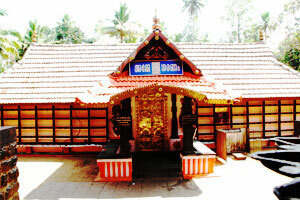 Shrine is constructed with granite and thatched with copper plate. Upper portion of the shrine is open for getting sunshine and rain. Devi takes ceremonial bath (Arattu) more than once in a year, is a peculiarity of this temple. This is due to the flood which happens more than once in a year enters the temple for Devi's arattu. Here Devi never goes to the river; river comes to her for her spectacular ceremonial bath. Holy ground of the shrine is covered with single granite blocks and the circumambulating path also is made with same. Installed left side of the temple outside the sanctum sanctorum is the deities Ganapathy and Sastha, outside the pathway is the Serpent. Special poojas are conducted here during the auspicious day of aayillyam. Another important offer is "Chathusatham". This is by submitting 101 naazhy(a measure) rice to Devi by the devotee and believed she grants the desire fulfilled. 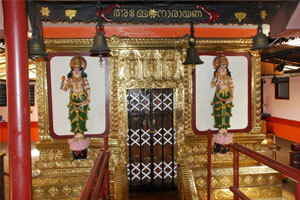 "Swayamvara Parvathy Pooja" also is done here for getting desired marriage. Devi celebrates her birthday in the Malayalam month of Meenam, her birth star is pooram and special poojas 'Ponkala, Annadana (feast for devotees) are conducted. Pooram star of every month such poojas and annadana are done. Tuesday and Friday are special days of devi. During the 41 days of Mandala period celebrates the festival and seven days specially celebrated. Irrespective of any religion all the people co¬operate for the well being of the temple and pray before the Devi for their needs. A Muslim family blessed by Devi many years back has been given the right for' Vedivazhipadu' (fire cracking) even now. A devotee from Tamilnadu donated the giant elephant barn during 1092 of Malayalam era.